Steve Chandler is one of my favorite coaches. He is bang on with his points and he is super funny delivering them. "Steve Chandler is now the author of 30 books that have been translated into over 25 languages. His personal success coaching, public speaking and business consulting have been used by CEOs, top professionals, major universities, and over 30 Fortune 500 companies. He has twice won the national Audio of the Year award from King Features Syndicate. 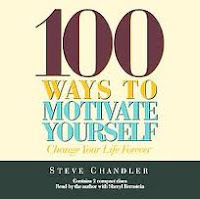 A popular guest on TV and radio talk shows, Steve Chandler has recently been called "the most powerful public speaker in America today." Right now if you sign up for his newsletter you can get some amazing ebooks and a couple of webinars. It's a pretty great deal!